Just thought I'd share a recent revision to my pond. 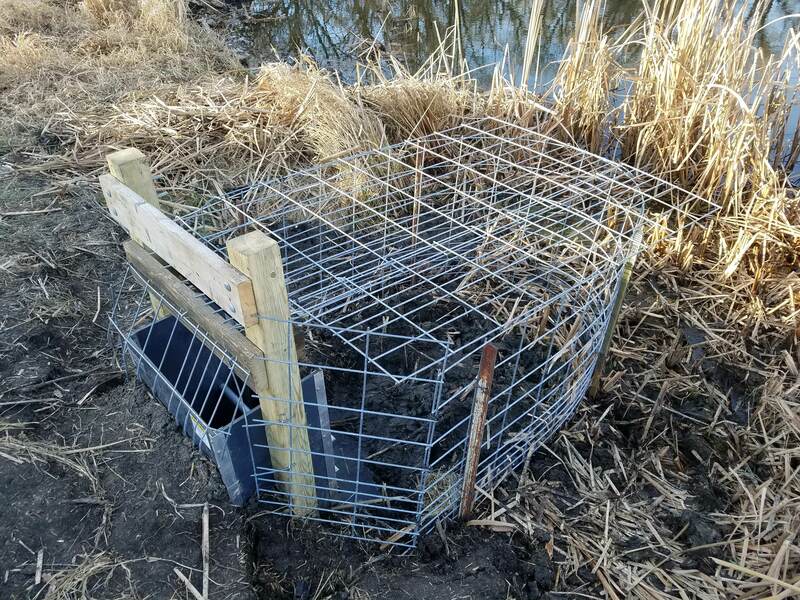 Quick review, I have a 2.5 acre nearly 40 year old eutrophic pond in southeast Iowa. Newly built ave depth 13 ft, currently 8-9 ft.
After I had a shock survey done in September, one of the suggestions by the Fisheries Management staff was to consider raising my pond level. I had a local excavating company evaluate my dam and emergency overflow, and check via laser level how much I could raise my pond (maximum) before having water running out the emergency overflow. I had 4 feet of 'space' to work with. My plan is actually only to raise it 18 to 24 inches, and evaluate the effect on all the shoreline, plus any back flow into my silt ponds. I chose to use a 'water inlet control structure' adapter, to modify my outflow pipe. It allows adding and removing 'slats' to control the water level. The existing outflow was an 18 inch corrugated steel pipe. See attached before/after photos. I hired the installation. 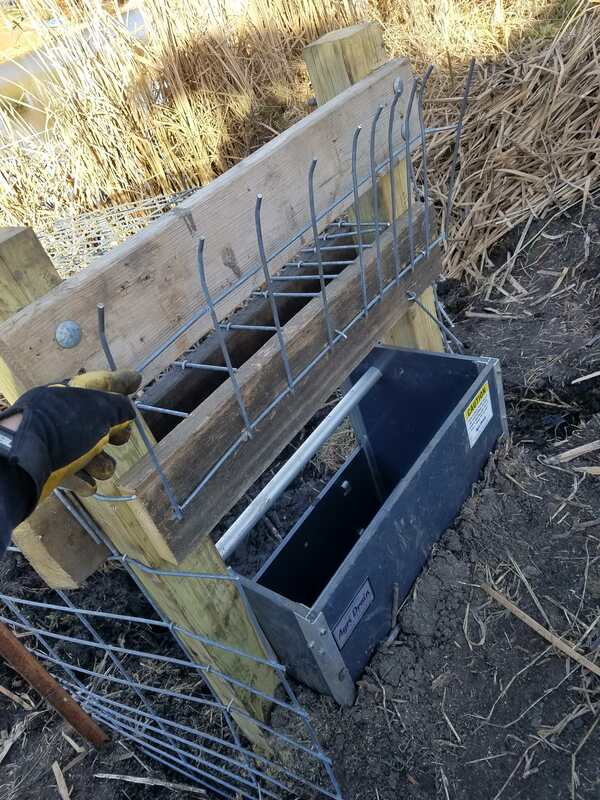 They had to draw down my pond about 20 inches so they could shorten my existing outflow pipe a bit, and then attach the flow control structure. It then needed 4x4 posts set in 36 inches of concrete on each side, to anchor it in place. I guess they can float up if not anchored well. We will see! Is the corrugated pipe hooked directly to the box? 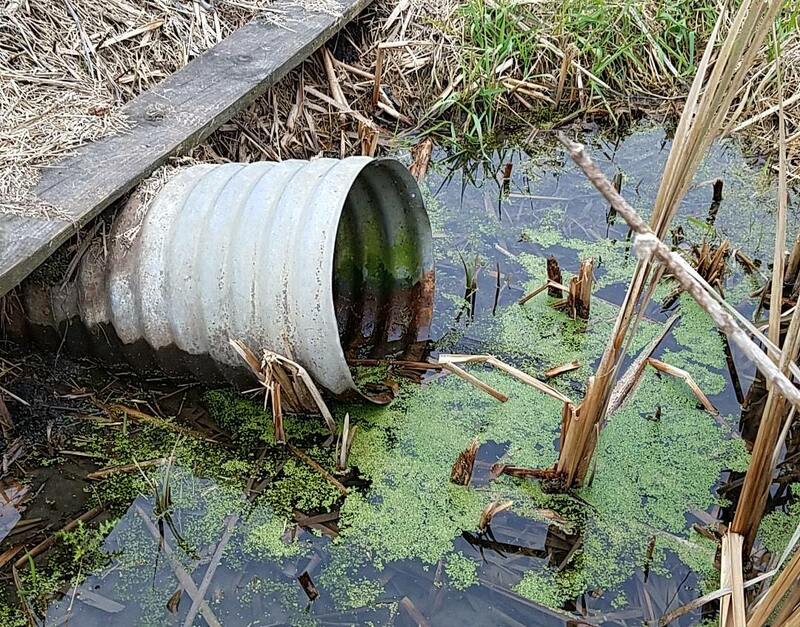 Has the pond ever filled from heavy rains to use the maximum potential of the regular overflow pipe? Any plans for a trash guard? Yes, the inlet control box is collar tied to the existing pipe. Yes, heavy rains have actually put my existing outflow pipe under water completely, but the emergency spillway has never run (in the past 3 years). could this be connected to the pipe on the backside of the dam and accomplished the same thing? then you wouldn't be losing fertile surface water, but pulling less desirable water from below? No, it's designed for the outflow pipe (water holding side of the dam). You should search the forum for 'siphon systems' which is what I think you're thinking of..
no matter which side of the dam the pipe turns 90 degrees upward from the thru pipe, it will control water level. water will find level. it is not common to have the standpipe on the backside of the dam, but some people do. it just seems it would have been an easy way for you to install yours without having to lower the water in order to install it. 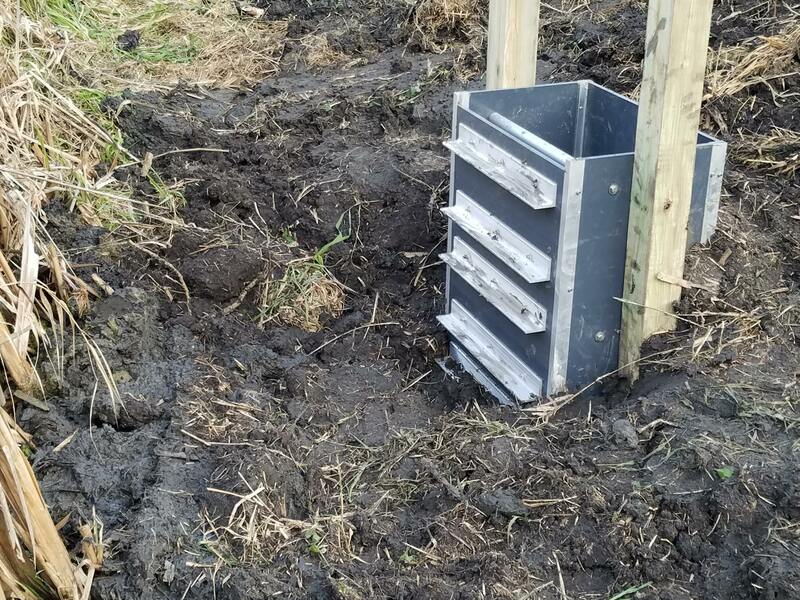 If you raise the backside outlet above the current water level, I believe it would raise the pond level (probably with this box too, although that's not the intent). Water will self level itself. HOWEVER, I would not do it because eventually silt and debris settle into low areas, and that is what you are creating by doing that. Eventually you would have a clogged pipe, and a washed out dam. I definitely am not an expert when it comes to this stuff! I had it installed on the water side because the specs said to. It also says it is designed for low pressure and may seep a little. Maybe the backside install would be too much pressure? Still, cool idea! And maybe that's the beauty of posting this. Someone else might improve the idea.. Thanks guys! Tracy, I will definitely let you and the forum know how it goes. I am curious myself, especially after a heavy rain event with lots of outflow, what the effect will be on those slats. For me, the ability to control the water level was high on my pond wish list. Between regaining some water via increased retention from this system, and benefits of bottom diffused aeration over time, I am hoping to reverse some of those years of eutrophication. That is how I see the problem of controlling the water height on the backside also. As long as a person had perfectly clean water it would work fine. But any debris or sediment would tend to accumulate in the pipe ahead of the control structure. Another problem could be flow amount. 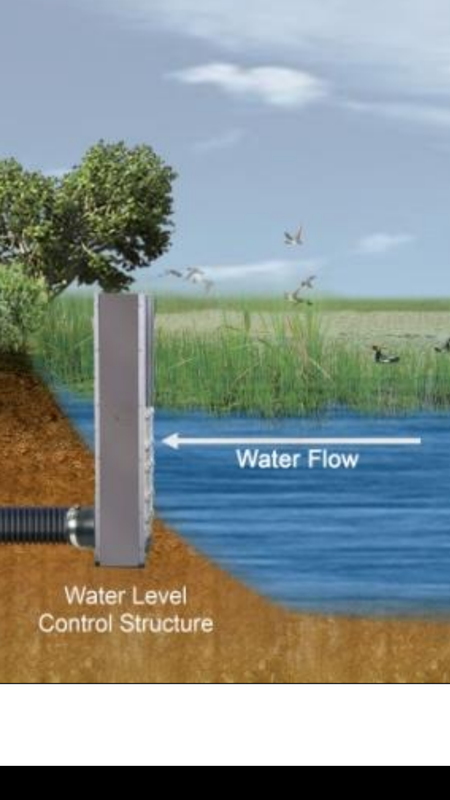 Water pushing horizontally through the dam then up over a control structure would flow a lot less water than water falling over a control structure into a pipe angling downward. So if a person was going to control the water level at the back side of the dam, it seems to me a secondary (other than emergency overflow) overflow pipe slightly above max full pool of the control structure would be needed to handle large rainfall events (on a watershed pond obviously). I really like the way DrLuke went about this. Checking the dam freeboard and finding out it was ok to raise the water level. I have raised the levels on four of my ponds so far and thinking about it on my recently created RES pond. But I am only talking 8-12" on each so not near the degree that was done here. As with everything I've done with my pond so far, I mostly followed the advice of the actual experts. There is definitely a cumulative wisdom effect of following what others are doing (and posting) on the forum. I've learned so much here that I'm motivated to try and contribute some useful knowledge. What typically happens is, I learn more from what other members comment on my original post, than I contributed in the first place (see Scott and Fish-n-chips and John's discussion above). But perhaps that's the ideal source of genuine knowledge. someone posted on here a long time back about putting the stand pipe on the back side. he said it was very common in his area. i didn't think about the silt in the pipe. it surely couldn't lie on the bottom. maybe up a foot or so would resolve the silt issue. i am in a warm climate, but i would think that the backside outlet could freeze. i also think the person posting about the pipe on the backside was using steel. i thought it was a good idea because it would be pulling the bad water from the bottom. also thought it might help drluke not having to lower the water level or work in the mud. i really like what drluke did, i bet almost all of us wish we could raise our pond level or increase the size. Steel will rupture with freezing even easier than plastic. I think the reason most people don't put it on the outside is fear of freezing. Also, if not collared and compacted well, water could wick along the pipe. 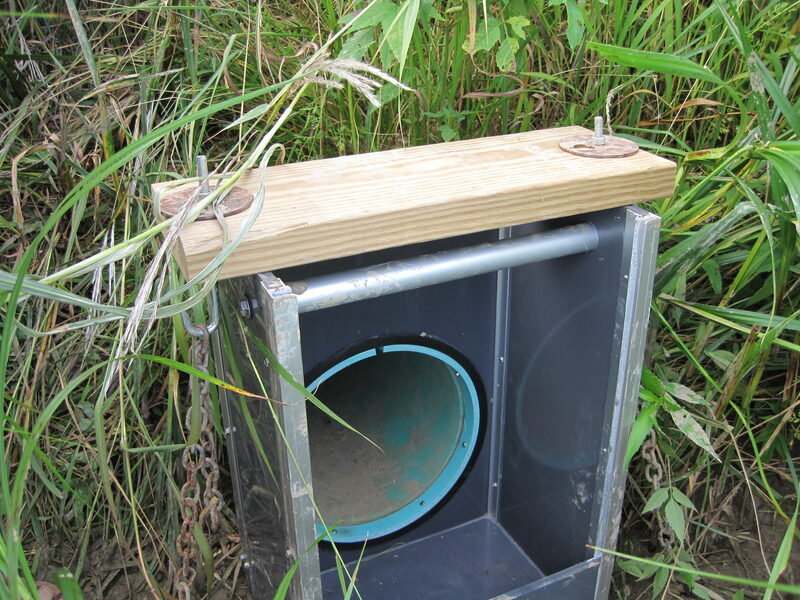 I have these outflow boxes on 2 of my ponds and in-line boxes on 2 of my wetlands. 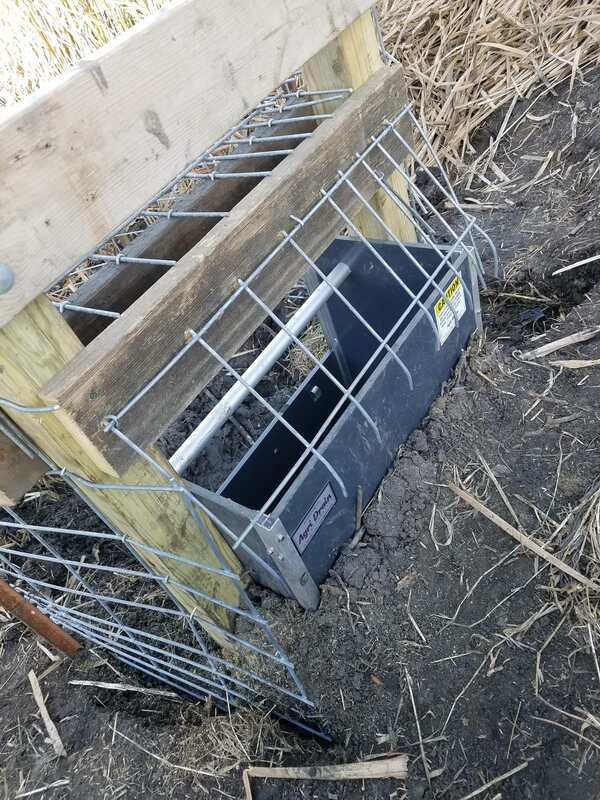 I keep the outflow boxes protected from UV and they have worked perfectly for many years. They are not cheap, but provide flexibility in adjusting water level. 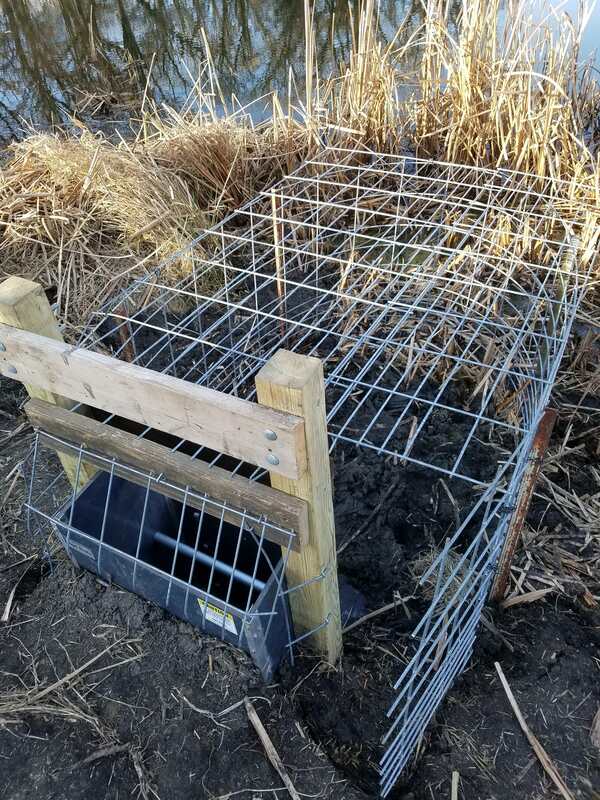 I also used hog panels to limit trash and keep out the muskrats. 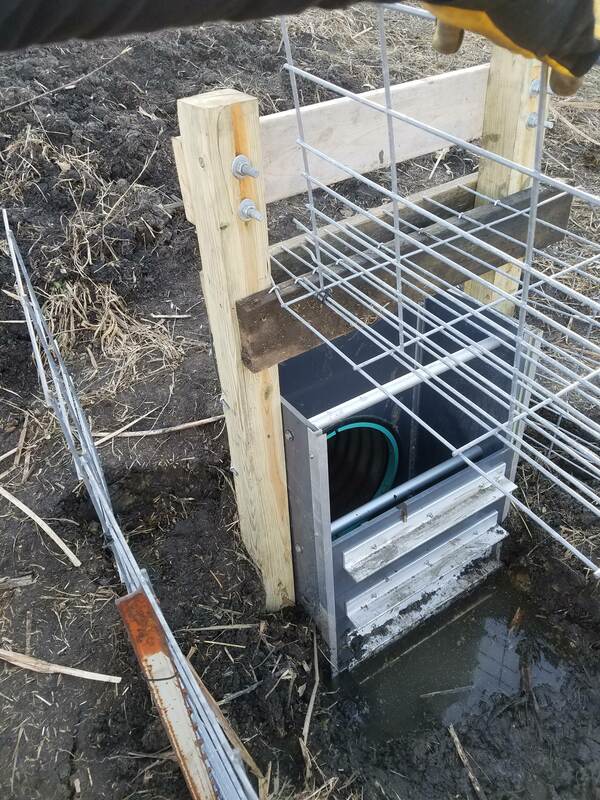 Update: Finally put a trash guard around the new outflow pipe control structure today. With the amount of dry vegetation around the pond looks like you need it. You put plenty of surface area which should keep it from plugging up like a very small surface area guard might. Part of the dryness is due to pumping the pond down for the outflow pipe install. I do have some ShoreClear ready for next spring,to work the cattails back. If the water rises as hoped, I might drown out some of them. Very nice DL... I'm in the same boat with ours and have bounced around what you're doing (either with that device or just adding a T connect or elbow to raise it a couple feet). Ours is around 6' so just adding a couple feet would do wonders. However, I'm really close to just breeching our dam shortly and draining it completely. Then over the next year or two get in there with a dozer and/or excavator to work the thing over well. You have a little more room to raise than I do... otherwise I'd go your route for sure. Best wishes! If you have the option to reset/start over, I would go for it! 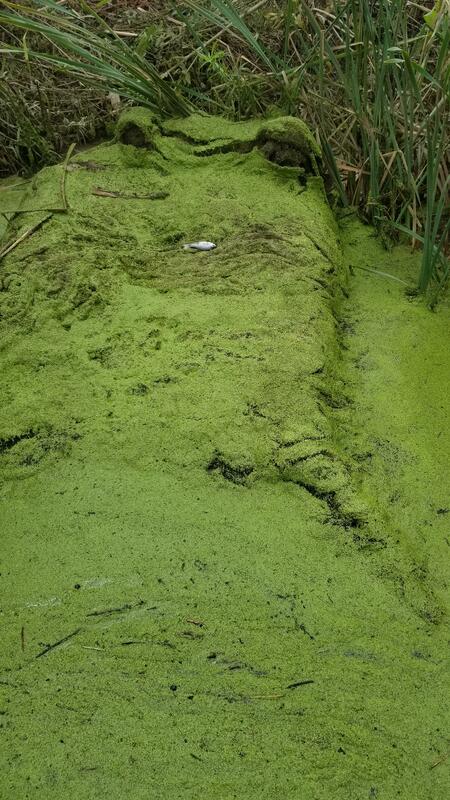 It will give you the opportunity to fix so many old pond issues, and remove many long term headaches. Getting rid of silt and nutrients, creating a 2 or 3 to one drop along the shoreline, adding structure pre-fill. Maybe consider a bottom draw siphon system too. If you do it, be sure and post about your projects, before and after. With lots of pictures! I've learned a ton of stuff from other pondmeisters that way. Good luck to you as well! Also wanted to add an update on my Water Control Structure I added to my outflow pipe last December. It's worked exactly as hoped, and maintained my ponds level around 24 inches higher than before it's install. 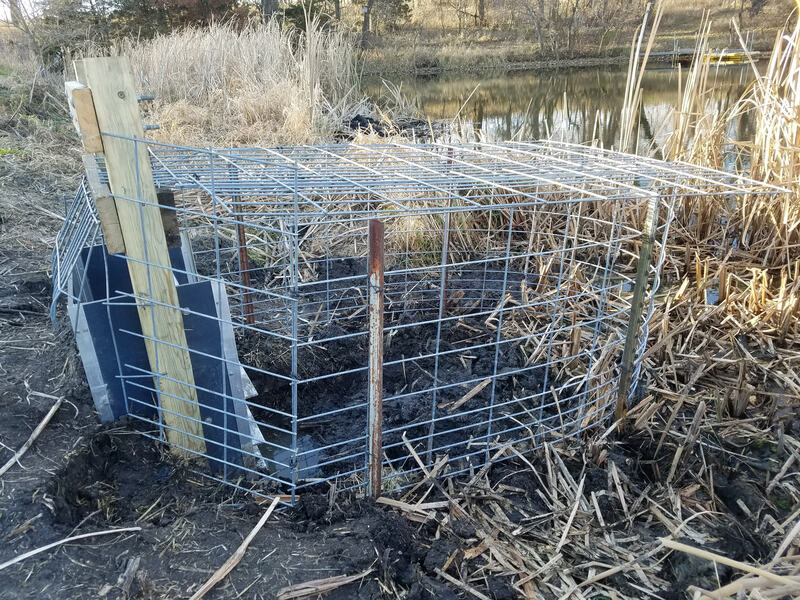 I have been able to pull a slat (which are 5 to 7 inches wide and slide into grooves on the pond side of the structure) to drop the level a bit for some FA work, and then replace it without any difficulty. 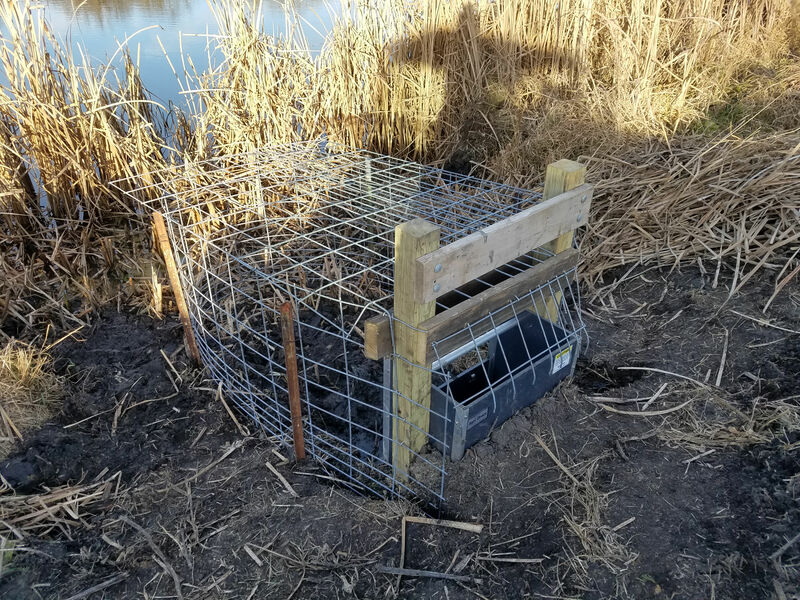 Here is the same trash cage following 13.7 inches of rain on Sept 1st (yes, THIRTEEN). I had a rather nasty outbreak of FA at the time, and had actually attempted to 'flush out' some FA via pulling a slat and then pushing FA mats to the outflow. That does work BTW. But NOTHING like what 13+ inches of rain did in 48 hrs. That is what this picture is of....FA (and duckweed) coating the entire outside of the trash cage, around 10 inches thick. The picture if from my boat, so not quite apples to apples with the above picture. The two 'bumps' are the tops of the 4x4s. The fish is a stunted BCP. I did some research a couple of weeks ago on laser levels, which could be useful for your needs. There is not a lot of discussion on forums that I could find. That made me wonder if lasers were worth it. I have a job coming up with a lot of interior walls and I was really looking for a new toy, I mean tool to buy. I searched the internet but got even more confused. I talked to some contractors at lumber yards and the guys that had lasers had really expensive ones that I could not relate to the cost. So I went to Lowe's and I got the Laser Mark LM30, it is manual level, only takes a minute to set up. I also got a Laserjam which is very nice. I had a kitchen to do right after I got it. It worked very nicely, even though I kept checking everything with a regular level. It was always perfect. For 200.00 I like it. I haven`t used it outside, you may need a detector to see it. All in all, I`m pretty happy with it, I am now looking at a more expensive model which is self-leveling. Her is a link which has many different models and brands.